Fallen boulders and debris from the slopes above a route used by the Pergau Lake maintenance team often cause obstructions, causing local authority concerns about the safety of users. As a result, it has been decided to realign the road further from the rock slope. Maccaferri has designed and supplied rockfall barriers to be installed along the road to make users safe, especially during heavy downpours. Our rockfall mitigation systems have been installed where necessary to prevent debris from falling onto the road. Pergau Lake is a man-made lake that was build alongside a hydroelectric dam. It is a tourist attraction for nature lovers in Kelantan. An alternative route, mainly used by the maintenance teams headed towards the Lake constantly suffers from obstructions caused by fallen boulders and other debris from the slopes above the road. This has raised the local authorities’ concern about the safety of the road’s users. As a result, the authorities have decided to realign the road further away from the slope surface to mitigate the problems caused by rockfalls. 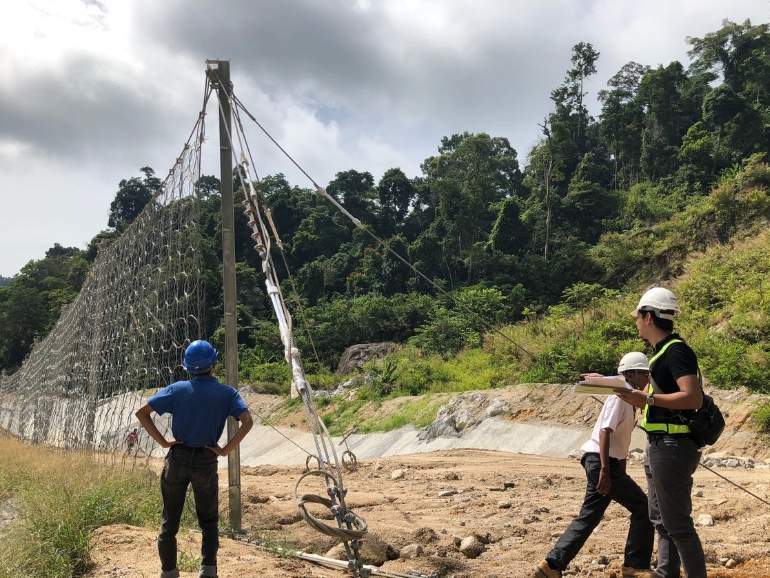 Maccaferri came up with the design and provided a solution by using our rock fall barriers along the road with an additional rock trench to ensure users’ safety during heavy downpours. Maccaferri produced its full and detailed design after a thorough investigation with the help of a soil consultant. The Maccaferri RB1500 Rockfall Barrier with a height of 5m and length of 650m was installed. Don’t hesitate to contact us for any question or doubt.